The R-PLEX Human CA15-3 Antibody Set includes a matched capture and detection antibody pair and calibrator for the quick and easy measurement of CA15-3 in biological samples. R-PLEX products leverage MSD’s electrochemiluminescence technology for better sensitivity and a larger dynamic range than traditional ELISAs. R-PLEX matched antibody sets enable the development of singleplex and multiplex immunoassays. Individual assays may be developed using MSD avidin- or streptavidin-coated plates. Custom multiplex assays with any combination of R-PLEX analytes, as well as R-PLEX plus U-PLEX analytes can be developed on U-PLEX MULTI-SPOT plates. To learn more about the advantages of R-PLEX products click here. 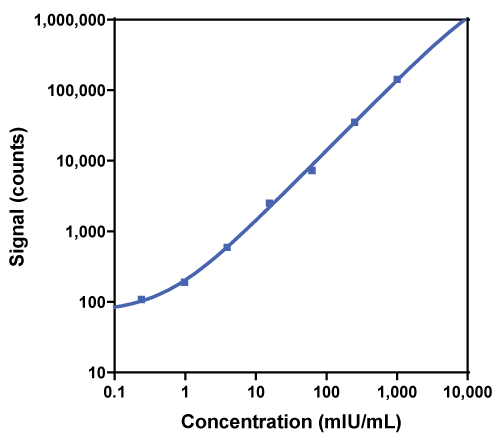 Calibration curve for the R-PLEX Human CA15-3 Antibody Set was assessed and representative data is presented below. Description - Cancer Antigen 15-3 (CA15.3, ADMCKD, ADMCKD1, CA 15-3, CD227, EMA, H23AG, KL-6, MAM6, MCD, MCKD, MCKD1, MUC-1, MUC-1/SEC, MUC-1/X/ZD, PEM, PEMT, PUM, MUC1) is an epitope of the Mucin 1 protein. Mucin 1 is a glycosylated transmembrane protein that lines the surface of epithelial cells in many different tissues. MUC1/CA 15.3 has been used as a marker for cancer recurrence for some types of cancer. Puerperal mastitis: a reproductive event of importance affecting anti-mucin antibody levels and ovarian cancer risk.